Papers must be prepared at the highest level of quality for inclusion in the conference proceedings. All papers must be: written in standard English and prepared in compliance with the paper formatting template. The following details on these factors should be carefully considered in preparation of papers. 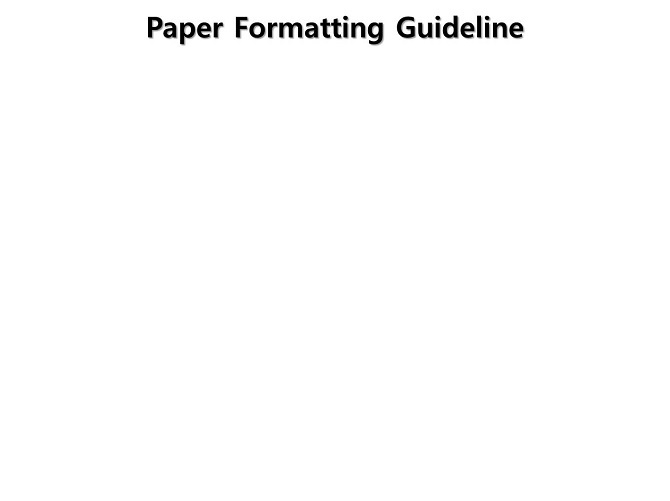 Papers must be prepared using an IEEE formatting template for papers. All authors should revisit the Microsoft Word template to ensure that important paper preparation instructions and conventions are followed. Page Limit: The maximum page limit is 4 inclusive of figures and tables. Please note that each full or student registration includes publication of one paper (up to 4 pages in length) in the proceedings. A maximum of 2 additional pages are allowed to extra fee. Each full or student registration fee entitles publication and presentation of only one paper. Each additional paper incurs an additional fee (be advised that submission of more than 2 papers as the first author is not allowed). Additional paper or page fees should be paid together with the registration. Language: The official language for the conference is English. Less than satisfactory English usage may form the sole basis for rejection of a paper and omission of any such final paper version from the conference proceedings. Authors whose native language is not English are encouraged to check their papers for proper English spelling and grammar using tools such as English grammar checkers available with most word processing application software. Review: The review process of BCI 2017 is double-blind. Please DO NOT MENTION YOUR NAME ON THE SUBMITTED PDF. Non-anonymous PDF submissions will be returned for correction. For Posters: Conventional Poster size is A0 (width x height:841mm x 1189mm) and the notification of acceptance will be made by December 1, 2016.